September 19, 2012 is PS I Love You’s 10th anniversary. On this date in 2002, Kent Rosenblum – then of Rosenblum Cellars, now of Rock Wall Wine Company – sent a check that helped to begin a Website. This contribution also helped to launch an advocacy group, and give us the definitive starting date of September 19, 2002. Meanwhile, Christine Wells, then of Foppiano Vineyards, had purchased the Web hosting. Jose Diaz, of Diaz Communications, built the Website, and we were on our way. It’s 10 years later, and I feel like I can use the phrase PS I Love You pretty freely, because it’s become part of my fabric… I’ve actually owned them as a group’s trustee for the last 10 years, as the founding executive director of P.S. I Love You, Inc.. This is an organization that we incorporated and put through its 501 (c)(6) tax exemption status legalities, with Foppiano’s help. Small claim to fame: I’ve written PS I Love You more times than any other human being on the planet in the last 10 years, I truly believe that… How many times a day? You don’t want to know. And, I realized, this is what this has become… an enormous family. The amount of personalities attached to it is almost mind boggling as I interface with the thousands of characters that have evolved. We’ve got a great handful of wineries that know “without a continuous effort from some outside entity for a variety, it goes back into extinction as a star…” Rusty Eddy, former executive director of the Rhone Rangers. Imagine a grape variety advocacy group that’s 10 years old; and, each year there’s been a Symposiumto study, learn, and implement the best methods possible for viticulture, enology, and marketing. Now imaging Foppiano and Concannon seeing the light, and producing the event. Two very important leaders in The Petite Engine That Could. You can also imaging that the event continues to draw in most members of PS I Love You; with a few curious others, who make the annual pilgrimage. Before she passed away, Patty Bogle of Bogle Vineyard & Winery, left a Petite legacy at UC Davis, by initiate (with funding) a Petite Sirah Heritage Clone Vineyard at UC Davis. It’s now at the Robert Mondavi Center, for students to tend and learn. Volunteers make my jobs increasingly easier each year. It took years before they showed up on the scene, because we had to launch our annual Dark & Delicious event for them to have something to do. They’re happy to put it all together, then take it all down again. Last year we had 65 wineries pouring Petite Sirah with 35 dedicate foodies joining us, making this a much loved event by the people who come out each year…year-after-year. Without Rock Wall’s help, we’d be dead in the water. This is truly grass roots at its best, with the members caring and sharing. Media have churned the wheels of this sleeper car. We’ve got an enormously immense, media following…. This is The Little Engine That Couldkinda story that most people love to help along it’s journey. They tell the stories of PS I Love You’s continuing adventures, encouraging our journey. At wine competitions, this is a wine that easily wins double gold, gold, and/or best of class. Trade people love to sell this variety as a sleeper, tasting rooms outsell each vintage before its time. Most Petite doesn’t even make it out side of a tasting room and its wine club. It was a Los Angeles wine retailer named Denny Caldwell, who told Jim Concannon to varietally label Petite Sirah so he could sell it… and sell it he did. within a few months, the first 300 or so cases sold out and had to wait for the next vintage. 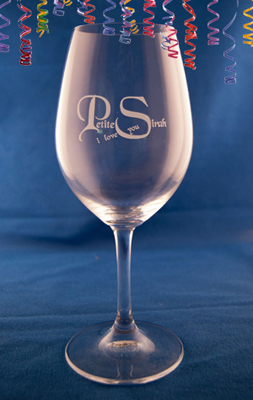 Petite Sirah as a variety was born in 1961. Mimi, my grandmother, told me when I was a child, “You wear my heart on your sleeve.” Little did she know how far it would go… Neither could I have imagined this.